Oliviera opened was born on the 1st of January 2000, with the aim of providing their guests with top quality products, which are always sourced locally when in season. Each recipe is crafted with a specific olive oil in mind and these are paired together on your plate. You will get to sample a variety of oils before and during your meal. Oliviera was originally only an olive oil store but has expanded to include a very small restaurant with inside tables and a few tables on the walkway of rue du Collet. 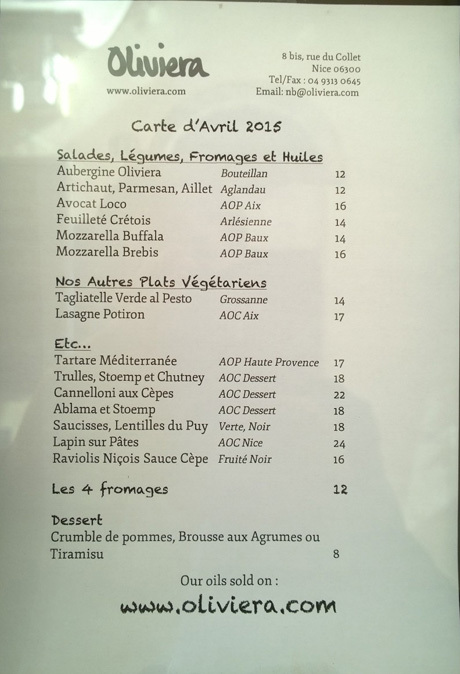 Shown below is an April 2015 menu of Oliviera Restaurant.